On the outside, 7800 Susquehanna Street looks like an old brick factory, with hazy entrance windows, a cracked walkway and faded paint. But recently, more than 100 people gathered at the Homewood location to celebrate the debut of the newest branch of the Swanson School of Engineering, a place dedicated to creation. The makerspace at the Manufacturing Assistance Center, or MAC, of the Swanson School opened Friday morning. The space is designed to serve as a center for small businesses and companies to develop their products more effectively by providing a base for private businesses. Pitt students and Homestead residents will also have access to new machine presses and software to further skills such as manufacturing and metalworking. Bopaya Bidanda, the chair of Pitt’s department of industrial engineering and the creator and director of the makerspace, first began developing the space last May. Bidanda said he saw an opportunity to promote both academics at Pitt and production in the Homewood neighborhood. “I wanted to help give back to the community and make it accessible, whether someone is in grade school or is a housewife,” Bidanda said. 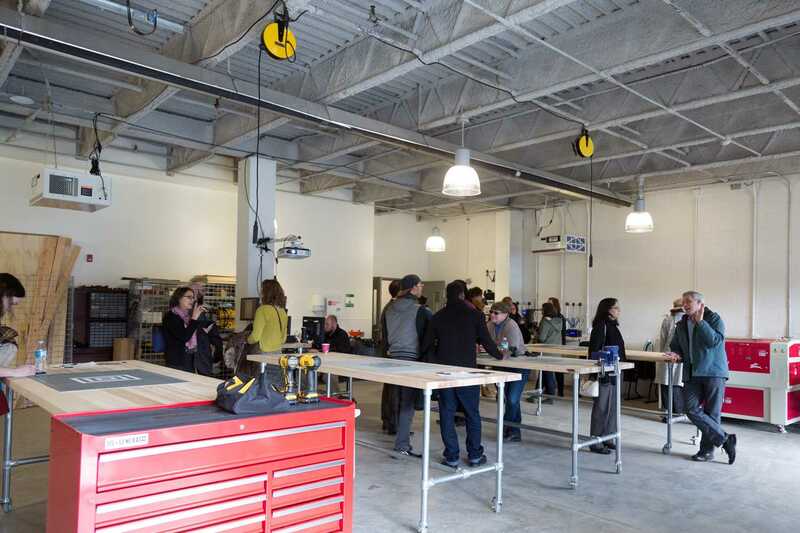 The makerspace is filled with rearrangeable tables and metalworking machines contrasting the laboratory-looking white interior. In the front of the room, a large projection screen is set up for any presentations that may be led. It includes a laser, 3D printing, woodworking and a soft-textiles areas as well. Classes at the center will be taught by faculty from the Swanson School as well as staff from the Pitt’s Innovation Institute’s Institute for Entrepreneurial Excellence and experts in different fields. According to Bidanda, the makerspace is designed to help with production speed for small businesses, bringing single production to mass-production levels. The layout of the building allows for customization in the arrangement of tables, machines and other tools for developing an individual’s product. The new location is part of the 9,000-square-foot MAC, which features a full machine lab, classrooms, and other work spaces. Currently run by Bidanda and other Pitt faculty, his goal for the new makerspace is to eventually have students running the facility by next year as instructors and advisors on projects. “The makerspace is supposed to bring in the community and interest them in making their products,” he said. Along with the MAC, 7800 Susquehanna houses other organizations not connected to the University. Local trade programs, small companies and studios also work out of the warehouse. Vice Provost of Special Projects Larry Feick was in attendance at the opening, and said he sees this new makerspace as “having a very positive impact in Pitt’s image and in the community.” He is involved in helping develop programs connected to the upcoming training hub at University of Pittsburgh at Titusville, and said this space will serve as a blueprint for projects at the training hub. “We’re committed to using this space to help lower-income families with making their own products and changing what is accessible to everyone,” Feick said. Claire Guth, a marketing and outreach specialist for the MAC, said the makerspace aligns as well with the Plan For Pitt, an initiative aimed at furthering the University’s academic development and community outreach. “The makerspace has an immediate impact on the underserved. A lot of our students come right from Homewood or take the nearby bus line,” Guth said. Along with the makerspace, the MAC provides three different training programs — Precision Manufacturing, Computer Numerical Controls (CNC) Operations and Programming, and Advanced CNC and Mastercam. Students spend eight weeks in the Precision Manufacturing program learning how to safely operate drills, mills, lathes, grinders and saws. In CNC Operations and Programming, students pick up more skills and are taught additional knowledge including the theory of G-Code machine-language programming. Students in Advanced CNC gain further skills and program verification. Guth also said only two modules occur at a time, and each module has a capacity of 12 students, so the MAC currently serves around 24 students at a time. One such student who has been making use of the smaller makerspace in Benedum Hall is Pitt senior mechanical engineering major Dani Broderick, who was also in attendance at the debut of the new makerspace. Broderick, who was an intern at the small space, said this new location will bring in new ideas to the MAC program. “The high-fidelity materials offered by the University can help with improving the quality and community reach compared to in Benedum,” Broderick said.